ANOTHER big green step in the fight against climate change and reduced carbon emissions has taken place in Noosa. 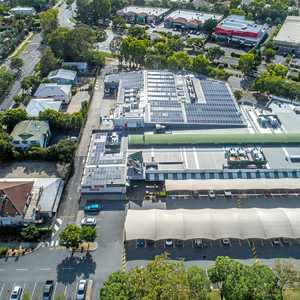 Noosa Village shopping centre, which occupies the block between Mary St and Gibson Rd in Noosaville, has installed a 250kW rooftop solar array across its roofs, providing a massive input into the centre’s power use. That’s the equivalent of powering 70 homes. “This equates to 336 tonnes of CO2 removed from the atmosphere, or the equivalent of 122 cars being taken off the road each year,” centre manager Ian McCosker said. “Our system provides clean energy directly to our retailers through an embedded network. Centre owner Fort Street Real Estate is also set to roll out similar projects in its holdings, working with the Noosa Village system installer Energy Aware. While the system won’t be able to supply the full load requirement of the centre during the peak hours in the middle of the day, it will be more than adequate at other times, perhaps even delivering some power back to the grid from time to time, Energy Aware spokesman Julian Hampton said. Zero Emissions Noosa, which has a goal of zero net community carbon emissions in Noosa Shire by 2026, welcomed the news. “This is a fantastic commitment by this shopping centre, and I hope encourages other commercial operations in Noosa to take similar action,” ZEN President Vivien Griffin said. Ms Griffin said the move set a good example for other centres to follow. “For example, Mark Stockwell now owns Noosa Civic and it would be great to see PV panels on the roof there as well,” she said. “The great news is that rooftop solar delivers both financial and environmental benefits.